Slieve Beagh South East Top is the 1007th highest place in Ireland. Slieve Beagh South East Top is the second most southerly summit in the Fermanagh/S Tyrone area. Slieve Beagh South East Top is the highest point in county Monaghan. I always get excited about putting forward the clocks in late March. To my mind it signals the end of winter, regardless of weather. In practical terms there is an immediate addition of light at the conclusion of the working day. Easter is never far behind, and the Hillwalking Year is ready to kick off. But just as every Easter must be preceded by a Gethsemane moment, it appears to me that the serious walker must mark the end of winter with some kind of fitting purgatorial experience. A real encounter with late March misery cleanses the hillwalker's spirit so that the renaissance to follow will be all the more dramatic. The problem for the zealot is to find a place that will bring all the miseries together, and of course, s/he will need to watch Met Eireann carefully in order to avoid the calamity of good weather. I was terribly lucky to find such a coagulation of the agonies yesterday at carefully chosen Slieve Beagh East Top. My research indicated that it was one of the bleakest spots on the planet, a cross between the Kalahari desert and the Panamanian swamps, and I was not to be disappointed. Of course you don't just "turn up" any old time for what is essentially a homage to the dying winter. You wait til late in the day as the gloom is descending, and if you have been careful about the weather, the wind will be getting up and the rain coming down in sheets. So it was for me. The local authority clearly appreciates what its got because it has created a network of impenetrable roads at the base of our obscure object of desire. 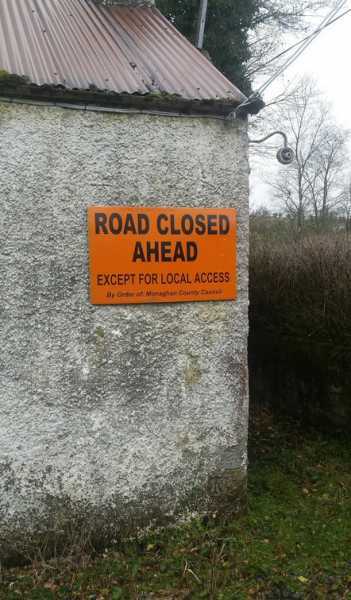 To cap it all, the Council lovingly maintains an orange coloured sign in the vestiges of the Republic stating ROAD CLOSED AHEAD at the entrance to the only logical start point to the ascent. Knowing that one is not wanted feels so "right" when you're on a mission like this.